When it comes to growing our business and reaching our goal of becoming the World’s #1 Data Management Company, there is a crucial question that needs to be answered: what do our customers really think about us? The Net Promoter Score (NPS) is an index ranging from -100 to 100, which measures the willingness of customers to recommend a company’s products or services to others. It is used as a proxy for gauging overall customer satisfaction with a company’s product or service, as well as customer loyalty to the brand. To put these numbers into perspective, a good corporate NPS score is around 20, and the average score of our tech competitors was 23. So, how did Veeam measure up to other tech companies and in the overall general business community? I have great news to share. Veeam scored an impressive 62! 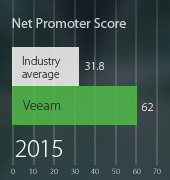 Veeam was up 15 points despite declines in customer satisfaction of other companies in the IT space. The secret? We never lose sight of why we are here, which is, ultimately, to ensure that every company in the world has the capability to operate as an Always-On Business, and our simple promise to provide Availability for the Modern Data Center. We are serious about our commitments to our customers, and our success is reflected in our NPS. This NPS is a phenomenal accomplishment and the reason we continue to be an industry leader. I specifically wanted to recognize that this extraordinary NPS is due to the great work of our R&D and Product Management department. Our customers highlight the quality of our products and the professional work of our customer support department, SEs and sales specialists, who, in a survey, got the highest ratings for their work. The satisfaction and trust that our customers have in our products is what sells Veeam. So, whether you’re speaking to a customer, a partner, or just to a personal connection within the business community, be sure to take the opportunity to brag to others about our NPS. We earned it!